» What are the side effects of taking too much magnesium? Excess of anything is bad. And it is also applicable to nutrients our body needs. Magnesium is an essential mineral for a healthy and strong body. But, it does not mean that excess magnesium is equally good for your body. Like other essential nutrients, vitamins and minerals, if you get too much of magnesium, it would negatively impact your health. There have been carried out hundreds of studies on the benefits and importance of magnesium for the healthy body. Magnesium helps in varieties of bodily functions like energy production, improving immunity, making bones stronger, maintaining better cardiovascular health, regularizing muscle and nerve functions. It is also called a soothing mineral because it improves mood and prevents anxiety by regulating our nervous system. Magnesium is required for nearly 300 biochemical reactions in our body. 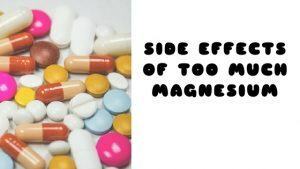 Our body gets magnesium from foods and dietary supplements we take. If your magnesium intake is lesser than the RDA then you have a magnesium mineral deficiency and you must immediately work on it. Some of the well-identified symptoms of magnesium deficiency include vomiting, loss of appetite, seizures, numbness, fatigue, muscle cramps, irregular heart rhythms etc. Magnesium deficiency may also result in a variety of serious health issues. For example high blood pressure, weaker heart health, Crohn's disease, type 2 diabetes, stroke, depression, kidney stones etc. What is the RDA of Magnesium? The daily recommended value of magnesium is as follows. 14 to 18 years old: 410 mg, 360 mg for men and women respectively. 19 to 30 years old: 400 mg, 310 mg for men and women respectively. 31 to 50 years: 420 mg, 320 mg for men and women respectively. For pregnant and lactating women (age 19-30 years): 350 mg for pregnant and 310 mg for lactating. And for older women of 31-50 years, 360 and 320 mg respectively for pregnant and lactating. How to fulfill your daily magnesium requirement. You need to eat enough magnesium rich foods to get your RDA of magnesium. You may not believe but you can get nearly 10% of your daily required magnesium from the fresh water you drink. You can fulfill your remaining intake by consuming enough green vegetables, nuts, beans, legumes, fruits etc. An ounce of walnuts and almonds contains 44.2 mg (11% of RDA) and 75 mg (19% of RDA) of magnesium respectively. A cup of sliced avocado has 42.3 mg (11% of RDA) of magnesium. Getting the excess magnesium from the diet does not have any significant health risks. This is because our kidneys can flush out excess magnesium we absorb from foods we eat. However, if the excess magnesium is due to the dietary supplements, diarrhea, nausea and abdominal cramping may be the initial visible signs of a magnesium overdose. And if the individual has issues with kidney functions, they should be careful because they may be at a higher risk of magnesium overdose. Elevated magnesium levels in the blood stream (also referred as hypermagnesemia) may result in hypotension or fall in the blood pressure levels, confusion, deteriorating kidney health and irregular heartbeats. The signs of difficulty in breathing and muscles pain may also be a reason for elevated magnesium levels in the blood stream. As the magnesium toxicity progresses and becomes severe it may result in cardiac arrest which is a life threatening condition. It is advised to follow the guidelines of a healthcare professional when taking magnesium supplements. Your diet is the best option to get all the essential body making nutrients and vitamins in a healthy way. If your body needs something that your diet could not fulfill then you need to consult with a doctor and follow the guidelines. This information was helpful as I was taking Milk Of Magnesia and experienced low blood pressure of 97/75. I also learned to space my intake of MOM with other medications. I have reduced my dosage for my hopefully temporary constipation episode. Hello Kay, thanks for your suggestion. Could you please tell what was recommended intakes?